Please come to visit and stay at the Grand Hotel Leveque ideally located in the 7th district between the Invalides, the Eiffel Tower and 15 minutes walk from the Champs-Elysées. You will enjoy doing your Christmas shopping there. Traditional Christmas markets are a popular event for all the family. They open at the beginning of November throughout the capital: in Place Saint-Germain-des-Prés, Place Saint-Sulpice, Place de la Nation, Avenue des Champs-Elysées etc. 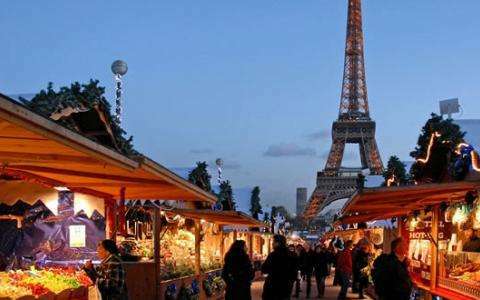 Originating in Germany and the Alsace region of France, Christmas markets have spread throughout Europe since the 1990s. Little by little, they have become an essential festive event during the Christmas season to the delight of all! The festive wooden cabins invite you to discover their decorations, festive objects, regional produce and handmade goods. A great place to find decorations for your Christmas tree, ideas for unusual gifts or delicious festive fare.